When can I expect to receive the magazine? I’ve paid but received another bill. Why? I need to change my address for Channel Guide delivery. How can I tell if I already renewed? How do I sign up for your free VIP service and get a digital issue of the magazine? How do I sign up for your free enewsletter 5toWatch? My channel lineup on the back cover isn’t correct. Why aren’t my local networks or local channel numbers included? I’m missing pages during the late-night hours? Why are there networks listed that aren’t available to me? How do you determine what networks are listed? I have an HD television — where can I find programming in HD? Why is the magazine no longer offered through my cable provider? Is the time zone specific edition of Channel Guide different from my current magazine? Can I sign up to get Channel Guide through you here? If you have not received your issue by the last day of the month, please call 1 888-899-9992 or email us at ChannelGuideMagazine@StrategicFulfillment.com and we’ll send a replacement copy to you ASAP. When you first subscribe, it may take 6 – 8 weeks to receive your first issue. Sometimes your payment crosses with our bill in the mail. If you’ve already paid for your subscription, just ignore the new bill. Or, log in at www.channelguidemag.com/myaccount where you can check to see if your payment was received. You can also pay your bill there. Just log in at www.channelguidemag.com/myaccount to change your delivery address. You can also renew, pay your bill or change your email address here. 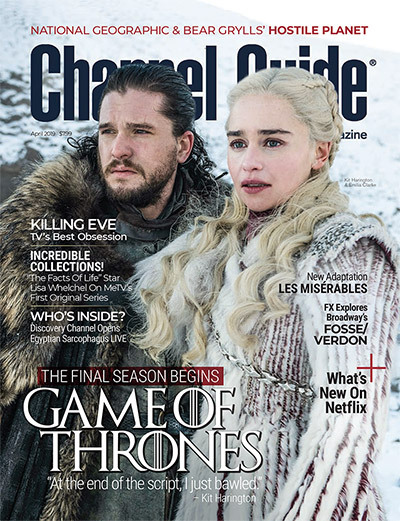 If you’re not sure if you renewed your subscription, log in at www.channelguidemag.com/myaccount and check your order status. After you log in, you can also renew right online if you haven’t done so already. Log in at www.channelguidemag.com/myaccount to find your expiration date and status of payments or to renew or pay your bill. You can also change your address or email address here. Every week Channel Guide sends out a free enewsletter suggesting the five best programs to watch this week. If you’d like to receive it, simply enter your email address in the form to the right. Yes. Channel Guide is available as a gift. Please contact us directly at 888-333-5388, and we will gather the necessary information from you to get you the correct lineup. Channel Guide serves other cities within your time zone that have different channel lineups and local broadcast networks. We have to accommodate them all. Your local networks have been replaced with national broadcast feeds. What that means is that instead of programming listings for local networks like WJLA-ABC7, WPXI or CBS5, the publication lists the national feeds of ABC, NBC, CBS, etc. It’s important to note that prime-time programming is the same no matter where you live (everyone sees Grey’s Anatomy on ABC Thursdays at 9pm ET/PT); however, daytime programming can vary from market to market because local broadcasters can select what programming they will air during the afternoon. You can use your onscreen programming guide or visit www.channelguidemag.com for local afternoon listings. Some networks are only available with a digital cable subscription — like H2, Bio Channel, Hallmark Movie Channel and LMN — and other networks require a premium subscription — like HBO, Showtime, Cinemax and Starz. Double-check with your cable or satellite provider if you are unsure if your package includes a network or not. There are many factors we consider when determining what networks are listed in the magazine. First, we look at the National Cable Television Association’s research on the top cable networks, specifically its ranking of what networks reach the majority of homes. Then we look at the complexities of the programming content offered on a network. For instance, movie networks take precedence over networks like C-SPAN, which has little or no time-specific or title-specific programming. We also prefer to list networks that can provide monthly schedules versus weekly schedules — this is, of course, to ensure we can offer you accurate, up-to-date programming information. Today almost all of the programming airing on cable and broadcast networks is available in HD (high definition). Most cable and satellite providers require you to have an HD receiver to watch programming in HD. Please keep in mind that just because you have an HDTV doesn’t necessarily mean you are watching a show in HD. You must watch HD content on a network’s specific HD channel. For example, Time Warner Cable airs ABC on Channel 12 in standard definition, and on Channel 1012 in HD. Most cable operators also have a function on their remote control where if you press the “Select” key a drop-down menu will appear and you can select “Watch in HD.” Selecting “Watch in HD” will immediately take you to that network’s HD channel. Why is Channel Guide no longer offered through my cable provider? In some areas, cable operators have discontinued offering a custom edition of Channel Guide as part of their product offerings. These custom editions were designed to match your cable channel lineup and were billed monthly as part of your cable bill. Fortunately, as publishers of both custom editions and time zone specific editions, NTVB Media can continue to serve your needs with our regular version of Channel Guide Magazine. Just click here to continue your subscription. Our time zone specific edition is very similar to your custom publication only you won’t have any ads from your cable operator included in it. You’ll still get the same daily programming listings for over 120 cable networks, your local channel lineup and the most comprehensive A-Z movie description section that features over 3,000 movie choices each month, plus sports listings, specials listings, editorial features and more. Sure. If your cable provider is no longer offering Channel Guide, go to subscribe and we’ll start sending you Channel Guide as soon as your subscription from your cable provider has ended.